So what exactly is an autographed ebook? Simply, it’s a digital copy of a novel (in the format of your choice — mobi for Kindle devices and apps, or epub for Apple Books, Kobo, Nook, or virtually any other e-reader app or device), with a custom cover including a hand-inscribed message for you, with your name and my signature. The cover will show up on your reader device or app, and it makes for a unique and unusual e-gift for yourself or anyone else. This idea was suggested by Andy Nicolaides on Twitter, and it was so good that I just had to implement it immediately! I inscribe each cover personally, and create a completely bespoke ebook just for you. iPad Pro makes the workflow pretty simple: I sign and inscribe a copy of the book’s cover artwork using Apple Pencil (via the Markup feature in the Photos app), and export the resulting custom cover. That cover is used with the original manuscript to generate an ebook that’s entirely yours. Delivery is via email, naturally. 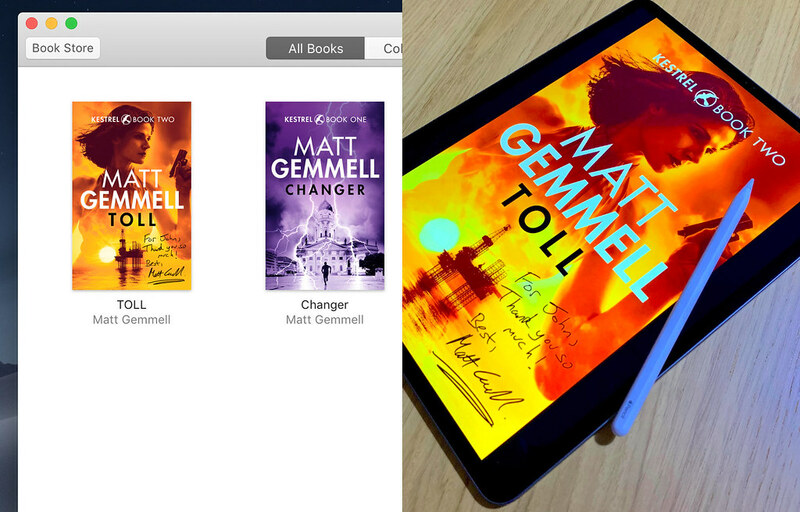 I’m delighted with this new way to get my books to you quickly and efficiently but still with personalisation (and it’s presumably better for the environment, which might be a topic you’ll encounter in TOLL too…), using new technology to create something that I don’t think I’ve ever seen before. One of the things I love most about my iPad is how it endlessly transforms into new tools as I discover new uses for it. This venture went from the idea stage to availability in half a day, which is stunning to me. As an independent novelist and publisher, it’s critically important to find new ways to turn my passion for writing into a sustainable business. I think that this kind of agile creativity is something that’s very much at the centre of Apple’s vision for these devices. I hope you’ll consider getting an autographed ebook of the new novel (and/or the first one! ), and I look forward to sharing more news about TOLL with you in the coming weeks as we approach the release date.